Milton Girls Softball offers several options at various levels of commitment and competitiveness for girls to continue playing softball. Our Spring League is open to girls in Kindergarten through Grade 8 who reside in or attend school in Milton. Optional Winter clinics start in January. Team Practices starting in early April with games running from late April to the end of the school year. New softball players are welcome in all divisions as this is an instructional and recreational program, yet competitive enough (delete) for all players in town. All Milton Softball teams foster an environment of positive self-esteem, team spirit and individual growth. Timeframe: January through late June. Days of the week vary by age level. The Summer Jam House League is a program designed for girls who are not playing Summer Travel but would like to continue playing softball over the summer. The level of play is aligned with the Spring Program. All Milton Softball teams foster an environment of positive self-esteem, team spirit and individual growth. Timeframe: Late June through July. Sundays and Tuesdays. Eligibility: Girls from Grades 3 through 8 who live or go to school in Milton. The Milton Summer Travel program is designed to provide a higher level of competition for the more avid and skilled players. Players develop confidence, skills, and teamwork while competing with teams on the South Shore. Milton Girls Softball is a member of the South Shore Summer Softball League (SSSSL) and over the past several years we have had 6-9 teams competing against other local towns. We have created balanced teams across each age group to support interest and growth. We achieve success through the dedication of our players, coaches and families. All Milton Softball teams foster an environment of positive self-esteem, team spirit and individual growth. Timeframe: Late June until early August. Monday through Thursday. 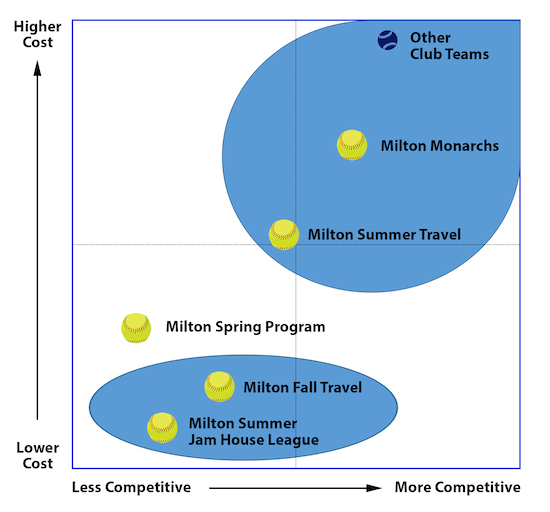 The Milton Monarchs is both a Tournament team and an Elite summer travel team. This Elite summer travel team plays in the South Shore Summer Softball League's Elite or "A" division. The primary goal for our Milton Monarchs "Club" teams is to prepare our players to become strong softball players through hard work, commitment and stronger competition. This is a competitive tournament team that requires girls to make a strong commitment. The commitment runs from the Fall through July with workouts running in to the Fall and the softball commitment beginning in January. The expectation is girls on the Monarchs will make 90%+ of the practices, games, and tournaments. The objective is to build a team that is competitive and designed to help girls who are committed to softball maximize their abilities. This program offers dedicated practice time focusing on developing fundamental softball skills, improving softball IQ, and understanding softball situations. All Milton Softball teams foster an environment of positive self-esteem, team spirit and individual growth. By combining the tournament and summer travel teams, players will see a higher level of competition and do not have competing summer practices. Tryouts for the folowing year's Monarchs teams happen in September. Eligibility: 12U and 14U eligible girls who live in Milton. Playing spring softball is not a requirement. Milton Fall Travel is primarily for girls who want to extend the Summer Travel season. Games are played on the weekend. There are no practices during the week. All Milton Softball teams foster an environment of positive self-esteem, team spirit and individual growth.